This winding six-storey block, suitably christened the Meander, attaches to an existing L-shaped block on a brownfield site along the canal (Kostverlorenvaart). Its head ends are marked by taller (eight-storey) development. The distinctive shape is to give as many of the 204 apartments as possible a view across the water, not to mention unusual floor plans. 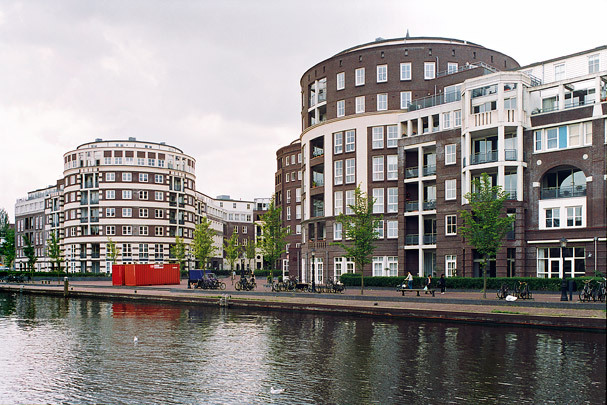 The Meander unwittingly became one of the Netherlands’ first gated communities, initially due to the introverted demeanour of its elegant architecture but also because the car-free quayside inadvertently became the property of the residents.